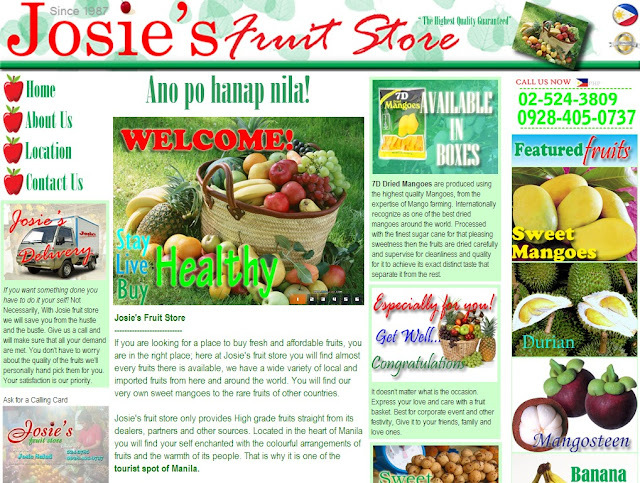 If you are looking for a place to buy fresh and affordable fruits, you are in the right place; here at Josie's fruit store you will find almost every fruits there is available, we have a wide variety of local and imported fruits from here and around the world. You will find our very own sweet mangoes to the rare fruits of other countries. Josie's fruit store only provides High grade fruits straight from its dealers, partners and other sources. Located in the heart of Manila you will find your self enchanted with the colorful arrangements of fruits and the warmth of its people. That is why it is one of the tourist spot of Manila. We make fruit baskets made especially for gifts and other festivity. We will free you from the heavy traffic of the metro and the hustle of making sure that the fruits you are fresh and spotless.